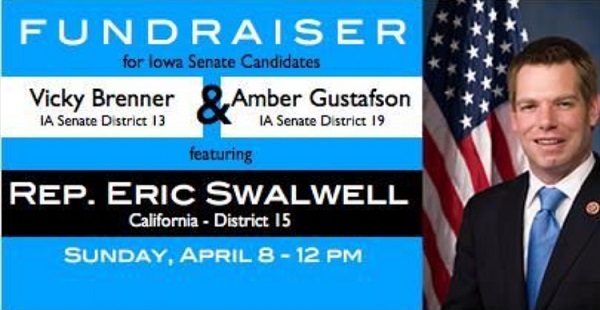 Gun Confiscation Advocate Raising Money For Iowa Senate Candidates! 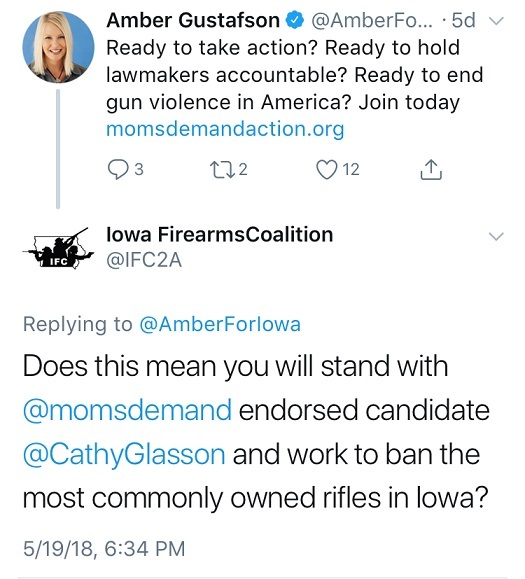 For the last several weeks, we’ve been trying to get former Iowa Moms Demand Action leader and Iowa Senate candidate Amber Gustafson on the record about a “full assault weapons ban” that is being championed by Iowa Gubernatorial candidate Cathy Glasson. Cathy Glasson is a Moms Demand Action endorsed “Gun Sense” candidate who is not shy about her desire to ban so-called “assault weapons” in Iowa. Amber Gustafson also holds the “Gun Sense” candidate badge of honor and is frequently recognized by national media as a mom running to represent Bloomberg’s gun control organization. Amber has even received hundreds of dollars directly from anti-gun leader Shannon Watts. Every time she’s asked about her fellow “Gun Sense Candidate” Cathy Glasson’s proposed ban all you hear from Amber is the sound of cricket’s chirping. Even though she doesn’t dare speak publicly about her gun banning ambitions, Amber’s more than happy to invite the original co-sponsor of the Assault Weapon Ban of 2018 to headline her campaign fundraisers. Vicky Brenner, who is running against Senator Julian Garrett to represent the Madison and Warren County area and Amber Gustafson of Ankeny both invited a bay area gun confiscation advocate to Iowa to headline their event. 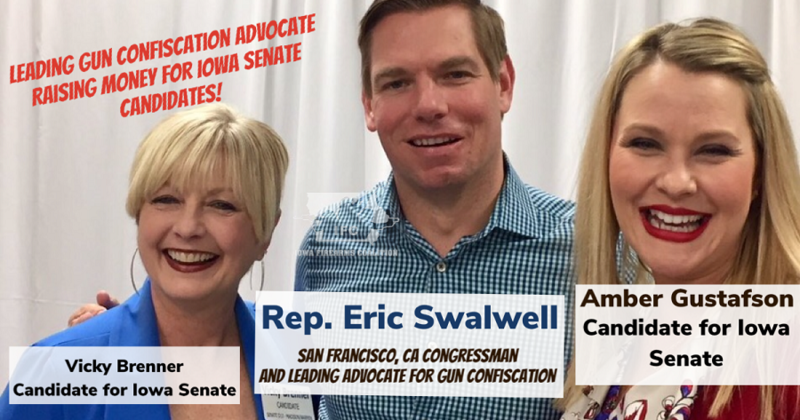 Even though Amber is too scared to talk openly and honestly about her gun control ambitions, the fact that she is using San Francisco politicians to bring California style gun control to Iowa speaks volumes about her intentions in the Iowa Senate. Firearms owners in Iowa CANNOT allow the head of the gun control movement in our state to gain a seat in the legislature. The Iowa Firearms Coalition is the only group taking it to the gun control lobby in Iowa. No one in this state is doing more to keep gun grabbers out of the legislature than IFC. As we roll into campaign season, we need funds to put reliable, pro-gun candidates back in office. Please donate to IFC-PAC and know that 100% of every single penny that you give goes to fighting the gun control lobby. Gun grabbers like Amber Gustafson get a significant amount of support from outside of Iowa. The out-of-state gun control lobby thinks they can overpower the freedom loving People of Iowa. That’s why it’s imperative that you help IFC-PAC mount a counter-offensive and fight back against the out of state elitists that think they can silence gun owners in Iowa! Like what you see? Join the only organization in Iowa that is fighting back and reporting what these gun control candidates are trying to do in Iowa! Please share this message and word of our coalition to liberty-minded Iowans who would oppose Rep. Swalwell’s agenda in Iowa. We most certainly do NOT need any of the extreme left wing anti gun laws or candidates from Iowa or CA making decisions for gun owners here in IA. Lets give it our all to keeo it that way!! 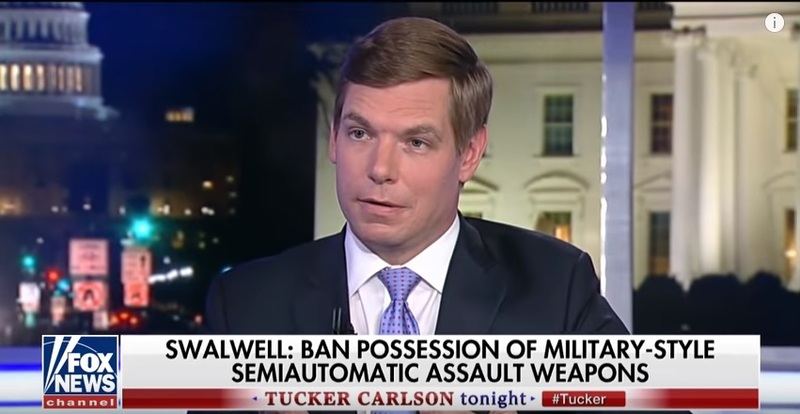 So here we have another person who has no knowlege of how to solve the problem of gun violence, let alone what consitutes an asault weapon. Asault wepons used in the military are automactic weapons used to kill people. The weapon called AR-15 and the like are used to kill varmits not people. They are semi-automatic designed to kill varmits not people. We don’t need another Senator with the same stinking thinking as Nancy Polosi and Chuck Schumer.